Awkward reunion? 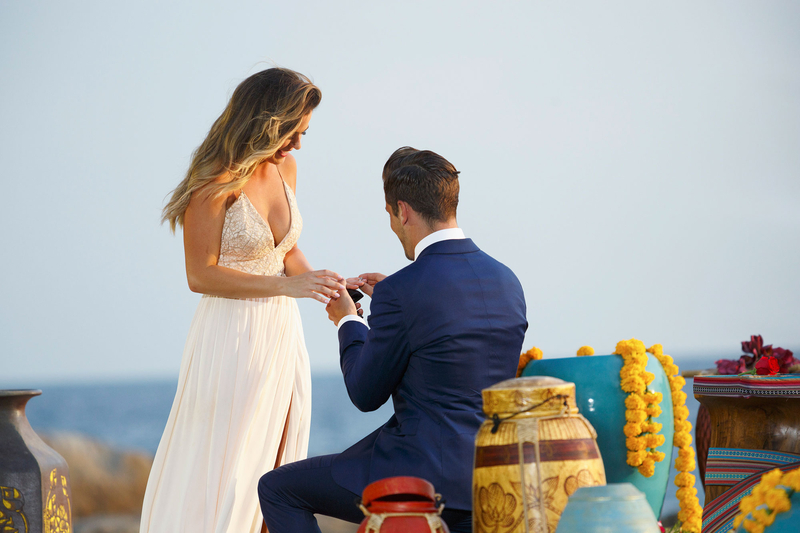 Former season 20 Bachelor Ben Higgins gave his ex JoJo Fletcher and her new fiancé, Jordan Rodgers, relationship advice during the Bachelorette&apos;s After the Final Rose special on Monday, August 1. Watch the video above to see what he said! Higgins, 28, was joined by his fiancee, Lauren Bushnell. As Bachelor Nation knows, the hunky Colorado native chose Bushnell, 26, over Fletcher, 25, during his season. Fletcher often name-dropped Higgins and how he broke her heart during her season. "Congratulations, first off. This is one of the most exciting nights. I know you&apos;ve probably been prepping for it for a while," Higgins said. "You&apos;re going to get criticism, no matter what you do in life. At times, we&apos;ve stayed strong through that. If you&apos;re getting criticism, you&apos;re doing something. And you&apos;re trying to make your relationship work," he continued. "So stay strong, support each other. There will be times when you want to pull your hair out because some 13-year-old girl in Idaho is saying names to you on Twitter. Just support each other, love each other, and a couple months out of it, you&apos;re going to look back and smile." Higgins and the flight attendant even joked about how traveling will be different. "In the airport, it&apos;s going to feel odd," Higgins said of the extra attention he&apos;s received. Bushnell chimed in: "You&apos;re going to feel like you&apos;re doing something wrong. It&apos;s OK."
Higgins and Bushnell will continue to stay in the limelight. As Us Weekly exclusively revealed, the two snagged a new reality series on Freeform. Monday night is presumably the first time Higgins and Fletcher have seen each other since his own ATFR. The pair ended on good terms, but Bushnell recently revealed that the couple didn&apos;t stay tuned to her Bachelorette season. "It was our world for so long," Bushnell told The Hollywood Reporter last month. "We just really wanted to focus on our relationship and needed a moment to take a step away." Watch Higgins and Bushnell in the video above!